Do you love traveling and looking for a credit card with travel benefits? Well, the U.S Bank Flex Perks Travel Rewards Visa signature card is here for you and it has made payments easier than ever before. All you need to do is just tap your credit card on the merchants device at each point of sale, and you will be good to go. This credit card is safe to use, keeps you notified about available rewards and it is easy to get started. 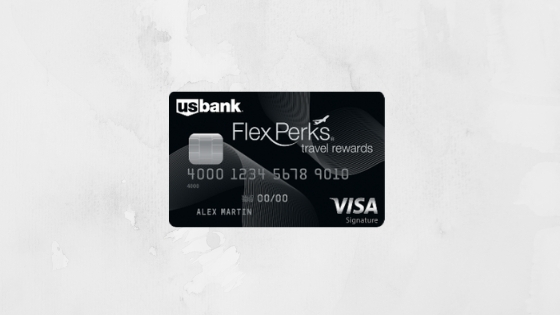 Read on to find out other amazing benefits of the U.S Bank Flex Perks Travel Rewards Visa signature card and how you can apply today. With the U.S Bank Flex Perks Travel Rewards Visa Signature credit card comes unbeatable features and benefits. You get to enjoy the usual U.S Bank credit card rewards, receive compensation up to $25 towards baggage fees or in-flight refreshments for each air travel award ticket; you get to instantly redeem your flex points on gift cards, travel, merchandise, cash back and other benefits offered from time to time. Do you want to travel but worried that you might get stuck? Not to worry as 25,000 FlexPoints, can be redeemed for $375 in hotel, car rentals, airfare, cruise lines and so much more. This enables you to plan your travels smoothly without any hitches. The card also comes with digital payment options as it allows you pay with the latest technology, for instance, Samsung pay, G pay, Master pass, Visa checkout, Microsoft wallet, making purchases easy in just a touch. 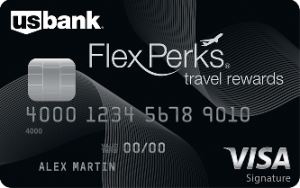 Are you interested in applying for the U.S Bank Flex Perks Travel Visa Signature card? Well, if you are eligible, the process is super easy. You need to be at least 18 years of age, a legal resident of the US and you should also have a social security number or individual taxpayer identification number. To apply, all you need to do is visit the US Bank website and fill out the online application form. If you already bank with them, all you need to do is log in, and they will fill in your information. The annual percentage rate is 16.24% to 26.24%, based on your creditworthiness when you open your account. Your due date is 24 – 30 days after the close of each billing cycle. You will not be charged interest on purchases if you pay your entire balance by the due date each month. The annual Membership fee is free for the first 12 months, but after that, you will have to part with $49. However, there are penalty fees of up to $39 for late payment, and up to $35 for a returned payment. For more information on fees, check out the US Bank website. The beauty of the U.S Bank Flex Perks Travel Visa Signature Card is that there are no foreign transaction fees. Order your US Bank Flex Perks Travel Rewards Credit Card today and enjoy great benefits, redeem instant rewards and have a smooth mobile and online banking experience.